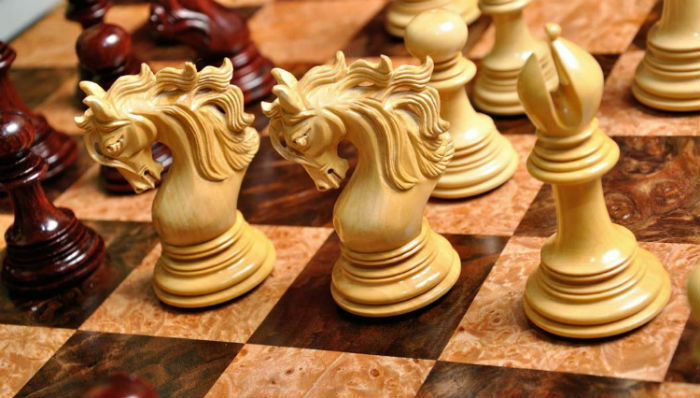 We’ve picked out and reviewed the most luxurious chess sets on the market today. The majority of the “luxury” in a chess set comes not from the workmanship or the design (though those things do contribute) but from the materials it’s made of. 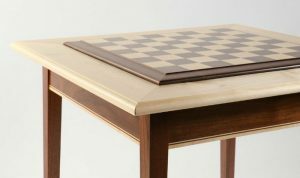 You’re going to want the finest woods, natural stones, and marble serving as the base for your chess set. This is not a place to skimp on, because it affects every aspect of the entire chess set! If you’re in the market for a high end chess set, it should come as no surprise to you that they can be quite expensive. While there are deals that can be found, a suspiciously low price tag should be a red flag to you. The finest materials come at a certain cost, and if the chess set is priced below that, it could be a sign that the materials are fake or not up to the quality standards you would expect. 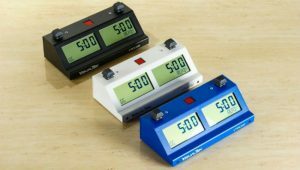 To make sure you find a deluxe chess set that meets your quality standards, we’ve put together a short list of our recommended products. Each one has been thoroughly vetted by our team, so you can buy with confidence. This set is the single most luxurious, high end, fancy chess set that we’ve ever had the pleasure of reviewing. It has been described as being, “as close to perfection as can be achieved by human hands.” That’s quite the hype to live up to, but we found it to be true. 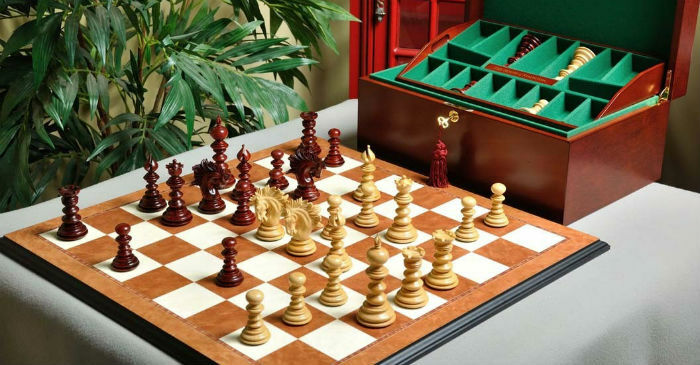 The House of Staunton is a trusted luxury chess brand that has been in the business of handcrafting top quality chess sets for nearly 30 years, and this set is no exception to that rule. If you’re someone who prefers to have the absolute best in everything, The Golden Collector Series Luxury Chess Set is just the thing for you. Your friends will certainly be impressed when they play a game against you on this intricately carved chess set. 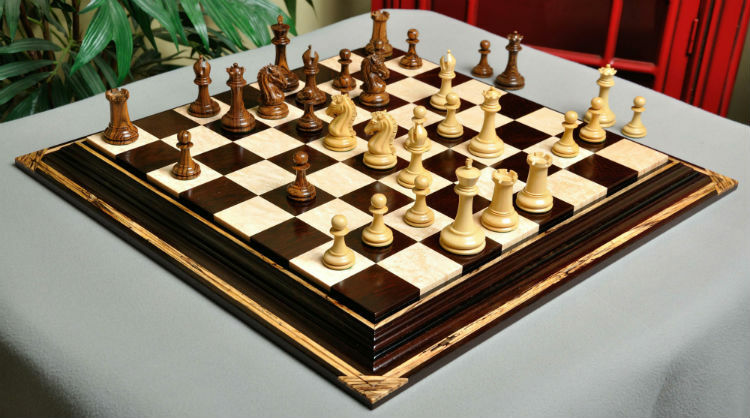 Even if you don’t play chess regularly, it makes a stunning decorative addition to any home or office. This high quality set comes complete with pieces, board, and box, so you won’t have to worry about anything being mismatched. 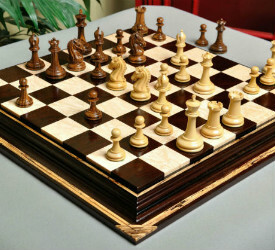 The chessmen are carved from the highest grade boxwood and genuine ebony. The King towers over the board at a full 4.4 inches tall, with a wide 2 inch base to preserve stability. Each piece is individually hand carved and hand turned by master artisans, to exacting quality standards. The fancy board is also hand carved in the United States. 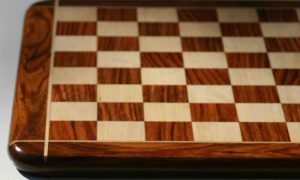 It features large 2.25 inch squares to accommodate the wide bases of the chess pieces, and is made from Red Amboyna Burl and Bird’s Eye Maple. This is a very unique chess set. 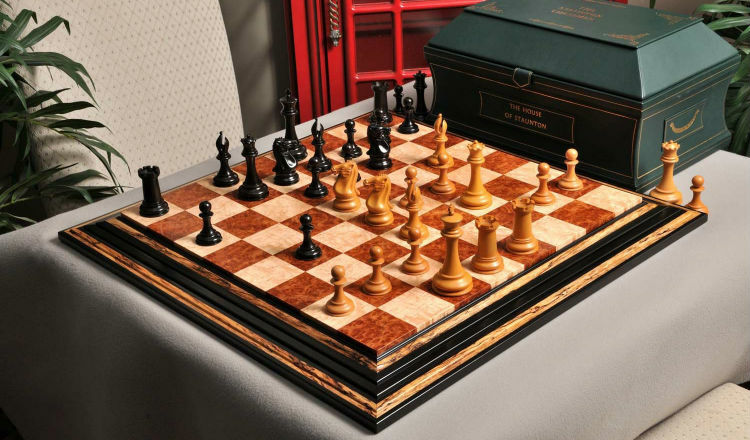 Its rare and exotic materials are what make it the most expensive chess set on the market today, as well as a great conversation piece in your home or office. This Ivory Chess Set Pieces are actually carved from the skeletons of ancient wooly mammoths – now referred to as mammoth ivory. Unlike elephant ivory, this type is still legal to harvest and sell, but it is extremely limited. Obviously, since mammoths are now extinct, there is only a finite amount of this mammoth ivory available, and all of it must be harvested by hand from the Siberian permafrost, as weather permits. If you can afford the hefty price tag, this is an incredible deluxe chess set that will be sure to impress your friends. You certainly won’t need to worry about anyone else having the same one! White’s army of chessmen are carved from a literal piece of history – the 40,000 year old bones of wooly mammoths that used to roam the Earth during the last ice age. Black’s army is carved from the same material and finished with a glossy black lacquer to provide contrast. 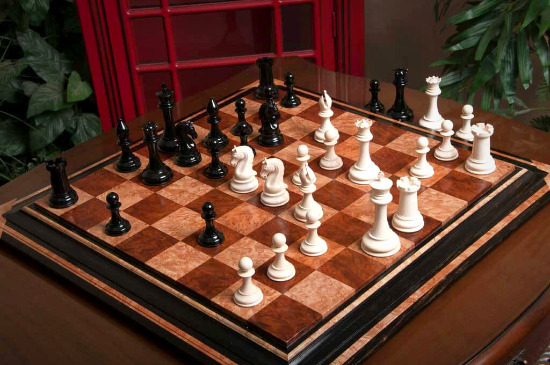 There is another version of this fancy chess set available that uses mammoth ivory for the white pieces and ebony wood for the black pieces, if you’d like to take home a piece of history at a slightly lower price. The design of the fancy pieces is modeled after the original Staunton pattern chess set, a traditional style that makes for a beautiful chess set. They are sold without base pads to allow you to fully appreciate the beauty of the mammoth ivory. Because of this, and their irreplaceable nature, this set may be better put to use as a strictly decorative item rather than a set that sees a lot of regular use. The Mammoth Ivory Chess Set comes with a chess box to keep the pieces safely stored, and you may add the chessboard of your choosing at a discounted price for the set. This masterpiece chess set from The House of Staunton features a luxurious vintage style and a level of quality craftsmanship that is rarely seen in modern products. We all know the saying, “they don’t make ‘em like they used to,” but in the case of The Camaratta Signature Series Cooke Luxury Wood Chess Set & Board Combination, they still do! 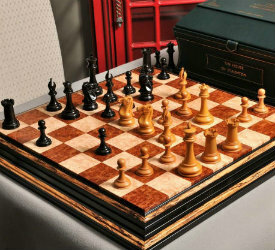 Every part of this deluxe chess set is bursting with elegance and luxury, from the warm maple wood of the chessboard to the cushioned base pads of the pieces that bear Frank Camaratta’s signature. So much so that this fancy chess set was even featured in an issue of WIRED magazine! That’s right, this expensive chess set is so high end that journalists are sitting up and taking notice. The design of this luxurious chess set is based on, of course, the Staunton pattern originally created by Nathaniel Cooke. But it also features Frank Camaratta’s uniquely designed Knight piece, and the set takes a lot of inspiration from Greek architecture. These seemingly disparate styles come together beautifully in this deluxe chess set, which is certainly a modern masterpiece. You may complete your set with the addition of a chess box in your choice of materials, some of which may incur an additional fee. Choose from Red Burl, Bird’s Eye Maple, Mahogany, Olive Ash Burl, Bubinga Burl, Elm Burl, or Brazilian Rosewood. Chess board bags are also available for an additional fee if you’d like to make sure your chess board is protected during storage or transport. With proper care, this luxury chess set could easily become a family heirloom that is treasured for generations! If you’re someone who never settles for second best, this is the perfect chess set for you. The high quality materials and beautiful design of the pieces makes the set the most gorgeous set of chessmen on the market. It is truly a masterpiece! The pieces in The Savano Series Luxury Chess Set are also uniquely designed, which makes them stand out from the crowd even further. The design maintains all the stateliness and elegance of the Staunton pattern while offering something completely different. The King piece stands 4.4 inches tall and has a 2 inch diameter base to keep it nice and steady. All of the pieces are very heavily weighted to provide a luxurious feel in the hand and during play. The King pieces feature an exquisite English leather base pad, and the rest of the pieces have the traditional green felt base pads. 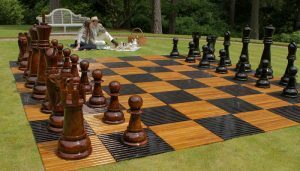 You can choose the color scheme you like best for your chessmen – either traditional high contrast black and white with Natural Boxwood and Genuine Ebony, or more of a reddish brown tone with Natural Boxwood and Blood Rosewood. The chessboard that comes with this set is also a work of art, but it doesn’t distract from the beauty of the chess pieces. It is handcrafted in Spain from Bird’s Eye Maple and Elm Burl wood. The total footprint of the chessboard is 23.75 inches square, and the board features 2.5 inch squares which should be more than enough to accommodate almost any set of chess pieces. To complete the set, you may choose your own chess box. They’re available in a variety of different woods, including Bird’s Eye Maple, Mahogany, or Red Burl. Each of the boxes is coffered to provide an individual, padded storage space for each chess piece and keep them from bumping together and becoming damaged. To protect your chessboard during transport, we recommend adding an additional chess board bag for a small additional cost. As someone looking for a top of the line luxury chess set, you may think that themed chess sets aren’t an option for you. 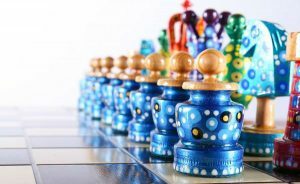 While it’s true that many themed chess sets aren’t held to the rigorous quality standards that we expect for the deluxe chess sets featured on this list, there are a few that manage to make the grade. 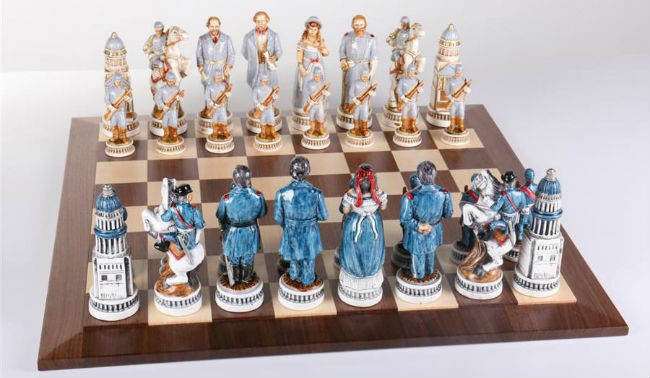 One such set is this historically themed 1863 Battle of Gettysburg Civil War Chess Set. If you’re a history buff that enjoys the finer things in life, this just may be the perfect fancy chess set for you. It also makes a great gift for such a person! The chess pieces featured in this luxurious set are each modelled after various historical figures prominent during the Civil War. One side features figureheads of the Union army, such as Abraham Lincoln and General Ulysses S. Grant. The other side features Confederate leaders like Jefferson Davis and General Robert E. Lee. Each of the presidents stand at a striking 6 inches tall. The pieces are carved from fine oxo-teak wood and each one is handpainted in Italy with remarkable detail. Just one look at these pieces will show you the level of care and attention to detail went into crafting each one. The chess board is handcrafted in the USA, actually not too far from where the Battle of Gettysburg actually took place. Isn’t that neat? It is made from maple and walnut woods, which will stand up to years and years of regular use. Not one but two matching hardwood chess boxes are included to house each army of chessmen. Not only are the pieces too large for one chess box, but you can’t have them fraternizing with the enemy! 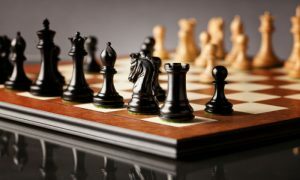 In this list, we’ve offered our review of some of the fanciest and most expensive chess sets available in 2019. 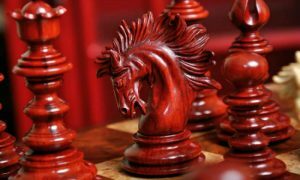 Though there are others that are more expensive, this list is a compilation of high end chess sets that are both currently for sale and worth every penny of their purchase price. The chess sets we’ve hand selected to feature in this list are among the best that money can buy. They all conform to our rigorous quality standards for fancy chess sets and have price tags that match that level of quality. 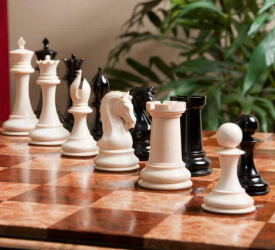 Of course, there are many fancy chess sets available on the market today that are even more expensive than the ones we’ve listed here, but we’ve generally found that their quality is not on par with the asking price. We were very careful to only include high end chess sets on this list that were also a good value for the money. If you’re spending that much on a chess set, we know that you’re going to want to get your money’s worth! After looking at hundreds and hundreds of fancy and expensive chess sets, we’ve determined that the ones featured on this list are some of the most luxurious and valuable sets that can be bought. There is something here for everyone, no matter what your personal style. There are traditional chess sets, modern chess sets, and even a historically themed chess set or two. All of these products carry our seal of approval and have been thoroughly reviewed for quality and excellence of workmanship. You can buy with confidence knowing that we’ve already done the hard work of market research for you to come up with these recommendations. All that’s left for you to do is select your favorite chess set and enjoy!